Been looking around and sampling some LED to add in some inserts. Bought some to test colors and decided on one I like but when I ordered the rest needed they were a different more pinkish purple. I know it's hard to tell from picture but can anyone recommend a bulb that is a true purple color closer to the top insert? I've heard that comet has the best purple. Never tried it though. Yes, comet's purple passion are by far the best of the several that I've tried. You need a Mongol standup more than you need to fix your purple LEDs! it seems to me in order to get the purple people want, bulb builders simply need to put more blue and less red into whatever they use to color the bulb. when the light shines through it, most purple bulbs come out looking pink. there's a good reason for this, which i will attempt to illustrate. The top half of the image is standard purple -- 50% red, 50% blue, half brightness. (The RGB values are 128/0/128). The bottom half of the image is what happens to that color when brightness is doubled -- my attempt to show what a bulb of that color looks like when lit up. 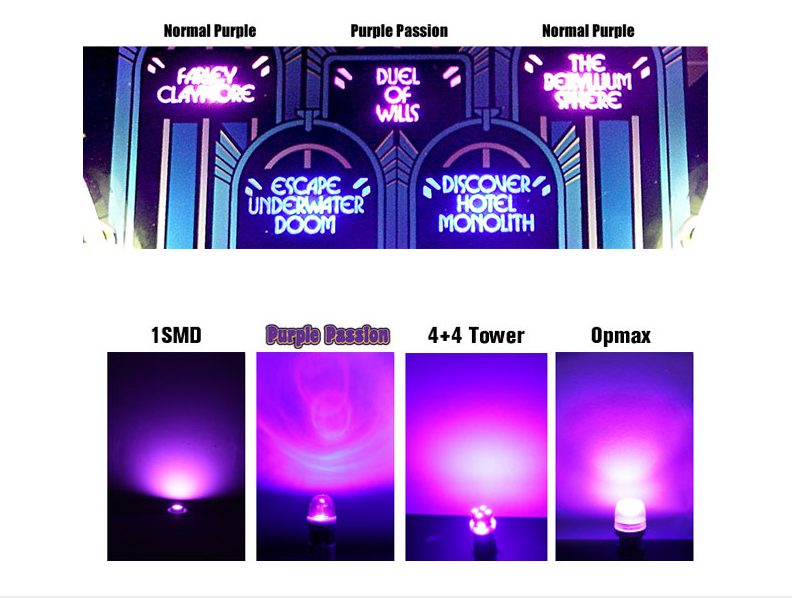 "Lit purple" basically looks pink, which is also what we are seeing in the real world when most purple LEDs light up, and why we hobbyists are so often disappointed with them. This is a very bluish-purple color, with twice as much blue as red (RGB value is 64/0/128, aka "indigo"). The bottom half of the image is that color with the brightness doubled, my attempt to show what a bulb of that color would like when lit. 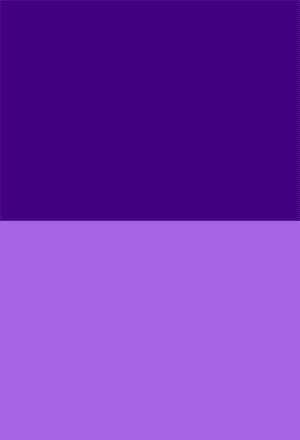 In my opinion, that color is closer to the shade we are looking for in our purple bulbs. 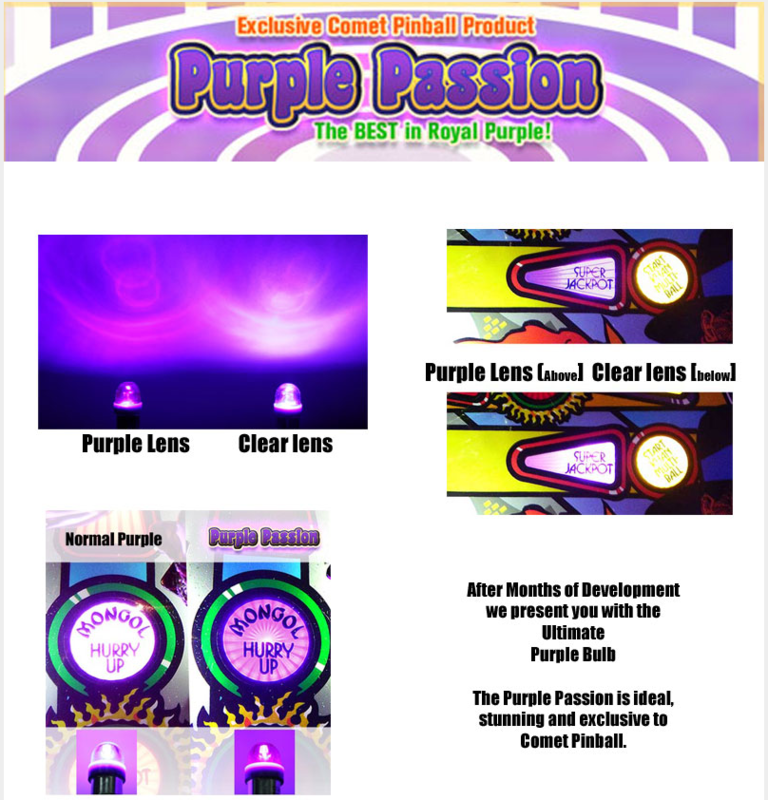 keep in mind it is impossible to "project darkness" so it's not actually possible to make a "dark purple" light. The current problem is not in its brightness vs darkness, but that manufacturers are using a hue that leans too much towards red, and not enough towards blue. that's why they look pink when lit. I believe a more blue-purple bulb would make purple inserts look exactly like what people want. Sorry Pez, Its not a matter of simply remixing the ratio of blue vs red. As a single light source, the more of blue or red, just makes it more blue or red and not purple, as you mentioned. It still comes out pink, bluish, or impossibly dark, and inserts may be white, as well as pinkish....that people want purple. More recently games like IM have a rich purple insert, and the effect is seen less here, so this does support and agree with your contention. The solution was a purple cap with a brighter diode. Another solution were 3 diodes +, mixing individual colors, but twice the price....and we all know no one wants to pay more. It took 9 months, around 60 iterations of powder trial and error and 8 tries on the lens to get right. Cost me more to do, then a Premium GB, so its around a 7-9 year payback. Not exactly a good business financial decision, but I wanted it, everyone wanted it, and a positive product was the result. Art, I have no choice but to accede to your vastly superior first hand experience on the subject! keep up the great work. Yes, I have used them and really like them. Thanks for all the work. 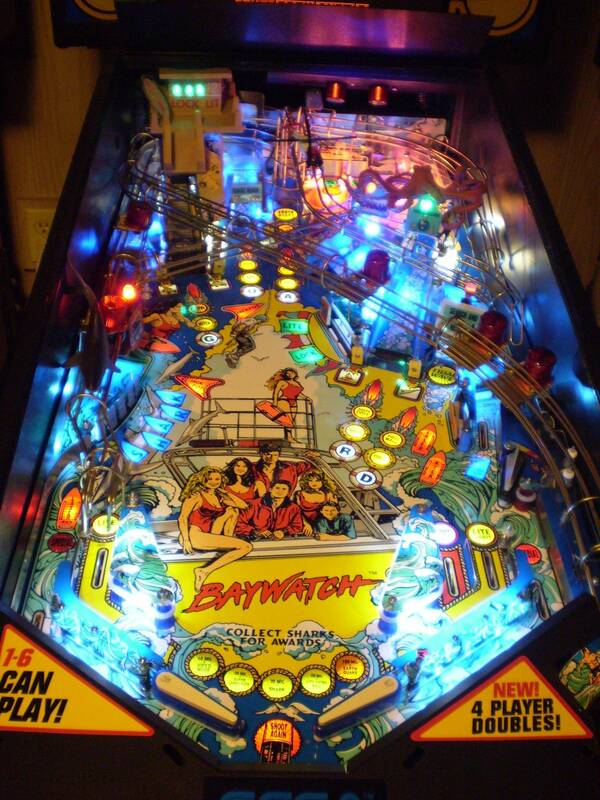 I hope you didnt take it wrong Pez....I went down that path and made me crazy, because you are right....except, its pinball! Yes, Art worked really hard and almost went crazy (crazier?) trying to get a "purple purple." So comet purple is the best? Yellow and Orange.....In Older Games, Grab a Twin 2835 Frosted. It will make inserts richer in color, without loosing brightness. Ill take some pics one day of the failed pile of purples. 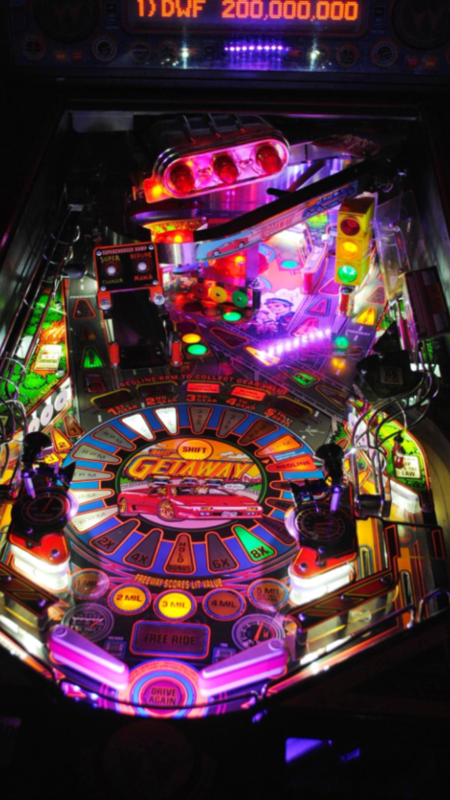 hours describing "Purple" to China and Taiwan...and Pinball. So the rest is time, and for me thats another story. IMO for Purple 1 SMD is standard and a light Purple. A slightly different, darker hue, is PBL 3 LED. UV can be used in some places, but usually only Super Flux Piranha lens to see the color, and its dimmer, but Ive used it too. Some people use Purples to look like UV! Op-Max is the brightest diffused Purple for GI and Spots. 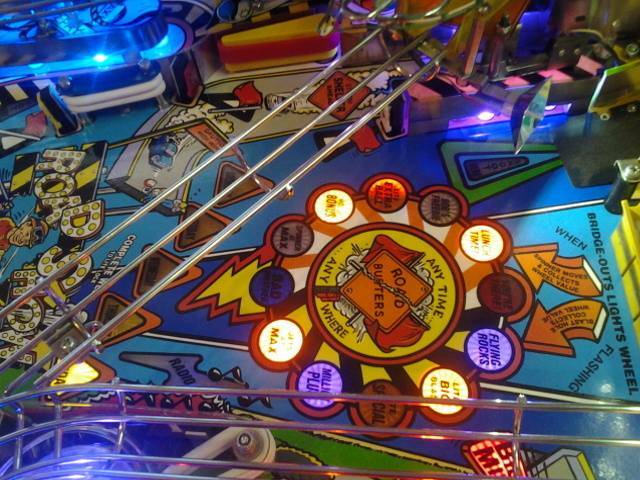 Pinball Centre LED's for me, just wow. Got the purple in my FT and it is something else. Are these purples from comet? Comet's Purple Passion, Sunlight, & Ice Blue are the ish. Purple is tough. Once you shine a light through it, it goes pink. 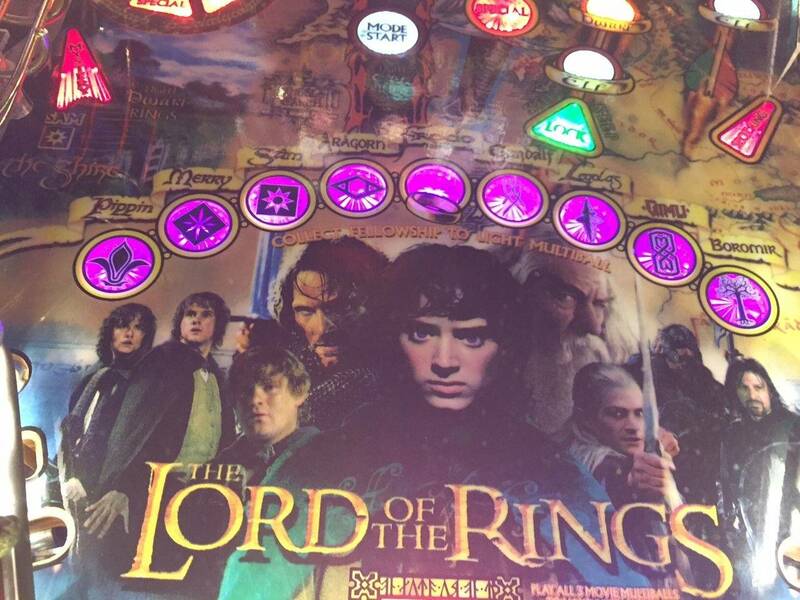 I wanted purple for my LOTR fellowship lights. everything looked pink. So I invested in some color purple photography gels, found them on ebay. I tucked them into the spot right under the insert and then put a purple light on them. The best effect you can get when the insert isnt colored purple! Here's some of the purple passion in my bk2k. 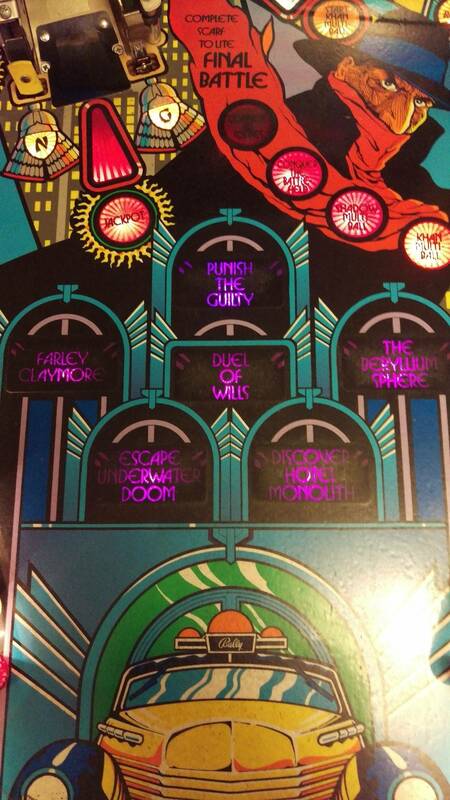 They're in some of the inserts and the pop bumpers. 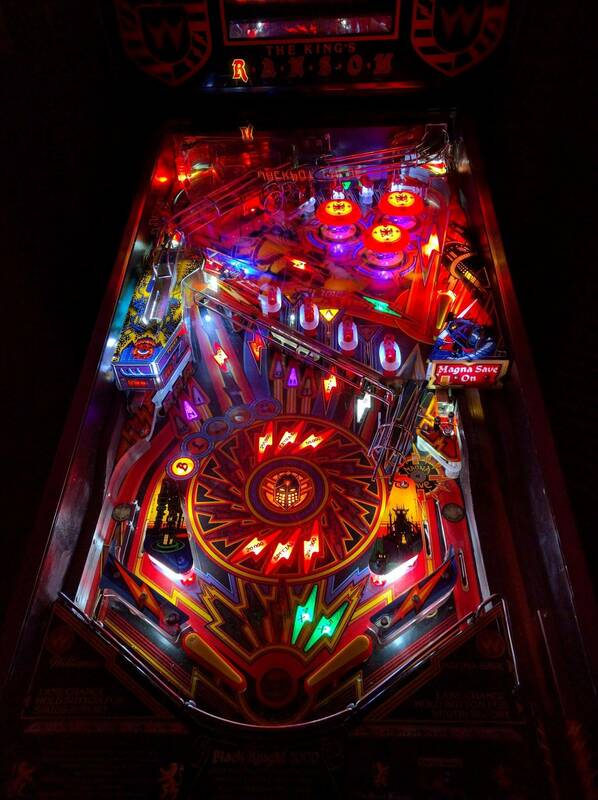 Actually in the pop bumpers, i soldered some of the purple ones upside down to the bottom of red comet pop bumper led board so it shines red up and purple down.